J.T. 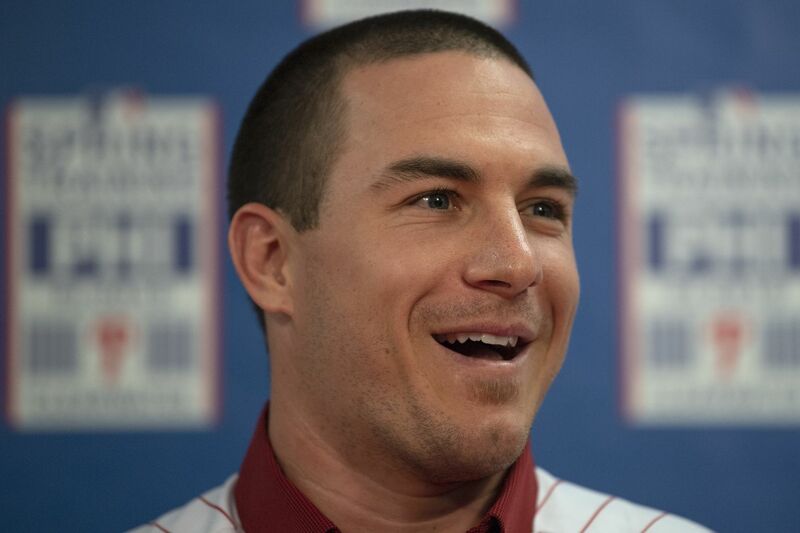 Realmuto is excited to move from pitcher-friendly Marlins Park to South Philly. CLEARWATER, Fla. -- J.T. Realmuto can still feel the disappointment of belting a fly ball to center field at Marlins Park, watching it carry for what he thought would be a double, and see in drop for an out into an outfielder’s glove. The Miami ballpark, with its large dimensions and lack of wind, presents one of the league’s stiffest hitting challenges. And it did Realmuto no favors. He hit just eight of his 21 homers last season at home. His OPS — which was the highest among all catchers — was 97 points greater on the road than at home. The Phillies believe they traded last week for baseball’s best catcher. But how much better could Realmuto be when he is playing 81 games at hitter-friendly Citizens Bank Park? The home run rate remained steady across the league last season as it marked the first time in baseball history that more than 1.15 homers were hit per game for three straight years. Home runs have seemed to fly over the last three years out of every ballpark except Marlins Park, which ranked second-to-last in homers twice in the last three years. Citizens Bank Park — Realmuto’s new home in South Philly — featured the 12th-most homers. Realmuto, according to MLB’s Statcast, would have hit seven more homers last season if his home games were in Philly instead of Miami. ESPN, using its Park Factor algorithm, ranked Citizens Bank Park last season as the fourth-most friendly ballpark to home runs. Marlins Park was last. It wasn’t just the deeper walls that made Marlins Park a challenge, but the sometimes eerily silence resulting from crowds that averaged just more than 10,000 per game. The Phillies, despite falling well short of the crowds they drew a decade ago, still saw nearly three times more fans last season than the Marlins. That atmosphere — the one that was so familiar during the team’s last great era — would easily return if the team finishes the offseason by corralling Bryce Harper or Manny Machado. Realmuto spent his winter scrolling social media, hoping to find a tip about were he would be headed to this season. It was almost guaranteed that he would be traded before the season. He packed his bags last week in Oklahoma, but still didn’t know if he was headed to spring training in Florida or Arizona. The call came Wednesday afternoon, he and his wife packed up their truck, and arrived the next day in Clearwater. Realmuto worked out a day later with his teammates at the team’s Carpenter Complex. And in six weeks, he’ll arrive at the ballpark which could make baseball’s best catcher even better.